The 93rd Scientific Assembly and Annual Meeting of the Radiological Society of North America (RSNA) was held November 25-30, 2007, at McCormick Place, Chicago, IL. More than 1750 scientific papers in 16 subspecialties were presented, along with more than 250 refresher courses and 83 multisession courses. The meeting also featured nearly 1500 educational and 600 scientific exhibits. In the technical exhibits, more than 750 companies showcased new and innovative radiology solutions across 535,300 square feet of exhibit space. GE Healthcare (Waukesha, WI) showcased its full range of radiology solutions at RSNA 2007. Among the new products shown was the Signa HDxt, a new-generation high-definition MR scanner, available in both 1.5T and 3T field strengths (Figure 1). The Signa HDxt system features 2 new applications: Cube and IDEAL. According to the company, "Cube can replace standard 2-dimensional (2D) acquisitions acquired in multiple planes with a single highly accelerated 3-dimensional (3D) volume scan. Users are able to review high-definition 3D data from 1 acquisition in any plane--axial, sagittal, coronal, or oblique--with no gaps or resolution loss." The submillimeter isotropic voxel size allows for visualization of lesions as small as 2 mm. The IDEAL application offers robust water-only images and provides users with important information from fat images as well. The company notes that IDEAL helps ensure consistent fat suppression, provides multiple contrasts (fat, water, and combined fat/water in phase and out of phase) in a single acquisition, and minimizes artifacts from chemical shift and metal implants, while also eliminating misregistration between fat and water. The Signa HDxt MR system also features expanded imaging visualization applications, including the following: AngioCard for vascular reporting and enhanced communication with schematics, images, and movies provided with reports for referring physicians; StarMap to assess iron deposition in the heart and liver with an automated scanning sequence; and Flow Analysis to quantify &#64258;ow characteristics and provide graphic and numeric displays of &#64258;ow and velocity data. The company also displayed the Signa Vibrant, a 1.5T dedicated breast MR scanner. This system uses high-definition technology and applications designed for breast MR, including VIBRANT acquisition, BREASE spectroscopy, integrated CADstream (manufactured by Confirma [Bellevue, WA]), and a specialized patient table designed to provide optimal imaging and enhanced access for intervention. GE also announced computed tomography (CT) radiation dose reduction results for diagnostic cardiac and neuroimaging perfusion examinations. They reported that the SnapShot Pulse technology (prospectively gated diagnostic cardiac CT) has been shown to reduce a patient's radiation exposure by up to 83%. The company's VolumeShuttle technology provides 80-mm anatomic coverage with 24% less radiation exposure compared with a conventional 40-mm cine perfusion protocol. Both of these technologies are available on the GE LightSpeed VCT XT configuration. GE also introduced its Web-based clinical information and work&#64258;ow management system, Centricity OneView. Designed to connect multiple discrete radiology information system (RIS) and picture archiving and communication system (PACS) solutions, this new solution provides a single point of access for radiologists and technologists and connects organizations to images, reports, and status information, regardless of the system from which they originated. "Centricity OneView supports the continuum of transforming information into insight, providing a holistic view of diagnostic clinical information," said Don Woodlock, Vice President and Global General Manager, GE Healthcare Imaging Solutions. "Internal departments and external partners often use a variety of RIS or PACS, which often lack consolidated imaging record data. Centricity OneView connects records across multiple systems and provides a single view of the patient's imaging data." Barco (Kortrijk, Belgium) introduced its first 30-inch color LCD display (Figure 2) at the recent RSNA meeting. The new wide-screen, bezel-free display can be used as 2 seamless 3MP heads or as a single 6MP display. Developed using In-Plane Switching (IPS-Pro) LCD technology (Hitachi, Ltd., Tokyo, Japan), the Coronis Fusion 6MP DL display "sets new standards for brightness and contrast, even from a wide viewing angle," according to the company. 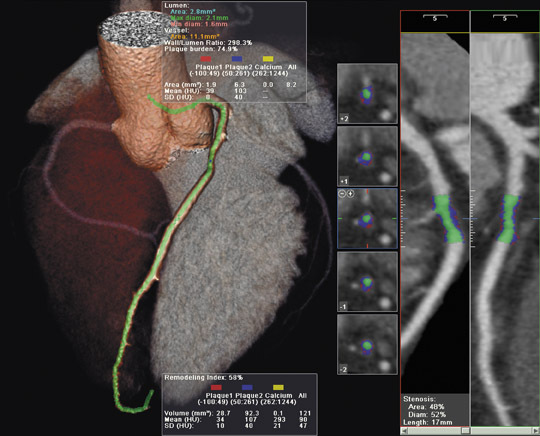 "The Coronis Fusion 6MP DL opens new diagnostic opportunities for radiologists, as it enables them to read CT, magnetic resonance imaging (MRI), catheterization, and echocardiographic images(or any combination) side-by-side on a single diagnostic screen," said Paul Matthijs, Senior Vice President of Barco's Medical Imaging Division. The new display features Barco's proprietary diagnostic luminance system, which delivers a DICOM-calibrated luminance of 800 cd/m 2 , which allows for simultaneous reading of color, gray-scale, and fused images. It also includes the company's Uniform Luminance technology (which distributes the brightness equally over the screen surface), and Barco's quality-assurance features, including the I-Guard sensor and MediCal QAWeb. Driven by a high-speed MXRT display controller, the Coronis Fusion 6MP DL display system supports 3D PACS applications with 30bit color precision and can be used for all 3D CT, MRI, and positron-emission tomography (PET) applications in combination with standard 2D PACS reading. Barco also introduced an advanced visualization solution, AVT, designed to provide instant access to 3D imaging anywhere, even from the physician's home, without the need for a dedicated workstation. This scalable thin-client solution allows users to access advanced visualization from any PC using a standard network or broadband connection. The company used graphics processing and image distribution technology designed to provide full functionality over low bandwidth, thereby offering smooth distribution of advanced visualization within a hospital's network and to remote offices and homes. 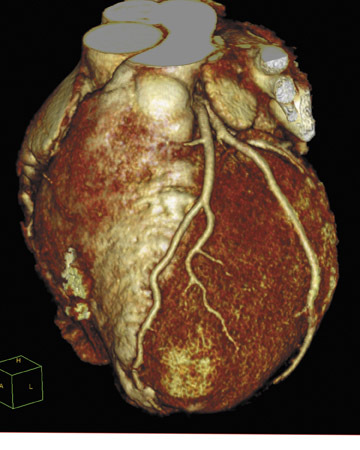 The advanced visualization tools include the following: AVT Reader, for high-volume, general reading of CT, MR, and PET; the AVT Vessel, for analysis of CT angiography and MR angiography (MRA) studies; AVT Cardia-S for structural analysis of CT cardiac studies; and AVT Cardia-F for functional analysis of CT cardiac studies. Beginning January 1, 2008, all of Barco's color and gray-scale diagnostic display systems will include a 5-year warranty. FUJIFILM Medical Systems USA, Inc. (Stamford, CT) highlighted its newest digital radiography (DR) system, the Unity SpeedSuite at RSNA 2007. The Unity SpeedSuite was designed to perform a range of general radiographic examinations, including table-based and upright procedures. The fully motorized system features a U-arm design and requires a smaller footprint than traditional DR systems. It also features a wireless handheld remote and comes equipped with the company's IIP technologist workstation. The system also includes the company's SpeedLink X-ray Control Software interface between the IIP and the X-ray generator; this software allows all exposure parameters to be set automatically for each examination. The company also previewed a new portable X-ray system as a work-in-progress. The new FCR (Fuji computed radiography) Go (Figure 3) integrates a customized version of the company's FCR Carbon XL CR reader and a notebook version of the Flash IIP console with a portable X-ray system from Hitachi Medical Systems America, Inc. (Twinsburg, OH). "Portable X-ray imaging presents a wide set of challenges for good image quality and can be labor-intensive for technologists," said Penny Maier, National Marketing Manager, Digital X-ray. "The FCR Go was designed to simplify the process and give technologists all the tools needed to efficiently produce outstanding portable images remotely." With the FCR Go, Fuji hopes to provide remote users with the same functionality and image processing features that are available on the fixed technologist workstation. All of the image optimization and advanced image processing features of the Flash IIP are available at the portable console, which allows images to be adjusted remotely. The system also allows the user to send images directly to the PACS and to retrieve patient worklists from the RIS or hospital information system via either a wireless or a hardwire connection. FCR Go uses an FCR cassette and provides images in as little as 23 seconds. It also features Fuji's SpeedLink X-ray Control Software for an integrated interface between the portable X-ray generator and the FCR reader. The company also unveiled its latest single-plate CR reader, the Carbon XL-2. This reader provides 50-µm spatial resolution for 18 × 24-cm and 24 × 30-cm sizes with a throughput of 94 images per hour from a unit that takes up only 2.4 square feet of &#64258;oor space. The company expects to begin commercial shipment in early 2008. In addition, Fuji announced the availability of its customizable FCR mobile digital X-ray packages. Designed as an acquisition-to-archive solution, the package is built around the FCR Carbon system. It includes a laptop version of the Flash IIP technologist's console that can be connected wirelessly for remote image transfer to a PACS. "With FCR Mobile, Fujifilm delivers everything that you'd expect in a hospital environment, but it is all scaled to meet the requirements of mobile imaging," said Maier. At RSNA 2007, Fuji also introduced new Version 5.0 software for the Flash IIP digital X-ray technologist console. This version provides the option of a 12-bit image display, customized values of interest look-up-tables, and log linear amplification. The system can address a variety of PACS and networks with scalable options for file size and bit depth. In addition, the company demonstrated Synapse PACS Version 3.2.1. This version helps the radiologist identify and access information and generate reports more quickly with the increased use of color, new icons, and a contrast scheme designed specifically for radiology viewing conditions. At RSNA 2007, VIDAR Systems Corporation (Herndon, VA) showcased the DosimetryPRO Advantage (Red). This new unit was designed with a red LED (light-emitting diode) specifically for reading GAFCHROMIC EBT film from International Specialty Products (Wayne, NJ). According to the company, "With the industry moving to eliminate film chemistry from modern cancer centers, the fast-growing use of radiochromic film in film dosimetry, quality assurance (QA), and intensity-modulated radiation therapy has in-creased the need for an accurate medical-grade device that utilizes red-spectrum light." The company also highlighted up-grades to the DosimetryPRO, including USB (universal serial bus) connectivity, compliance with new European Union standards for lead-free electronics, and a new removable LED lighting system designed to provide a longer lamp life. The company also showed the CAD PRO Advantage X-Ray Film Digitizer, which was running with the company's ClinicalExpress software. Toshiba America Medical Systems, Inc. (Tustin, CA) introduced its first dynamic volume CT system at this year's meeting. The AquilionONE features 320 ultra-high-resolution 0.5-mm detector elements and can scan an entire organ, including the heart or brain, in 1 rotation. Covering 16 cm of anatomy in a single rotation, the new system can perform functional imaging by capturing an organ's dynamic blood &#64258;ow and function. The system can also be used to perform a comprehensive neurologic examination with arterial, venous, and whole-brain perfusion (Figure 4) in a single study with reduced contrast and radiation dose. "The introduction of dynamic volume CT marks an important milestone in the history of CT," said Doug Ryan, Senior Director, CT Business Unit, Toshiba America Medical Systems. "AquilionONE is the culmination of a decade of dedicated research and establishes a new frontier in CT imaging, offering ad-vanced applications that can significantly enhance patient care while reducing the cost of healthcare worldwide." 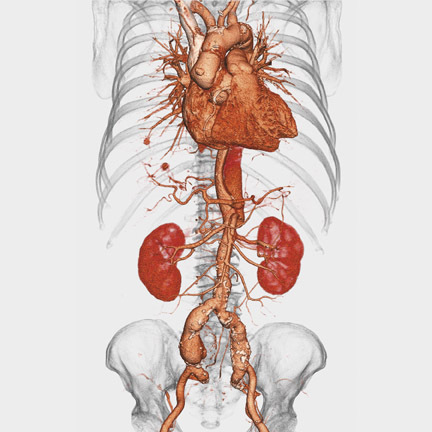 The AquilionONE includes Toshiba's coneXact dynamic volume CT reconstruction feature and a table that can accommodate patients weighing up to 650 lbs. The company expects to begin commercial shipment this summer. In the area of MRI, Toshiba previewed its open-bore 1.5T MR system, the Vantage Titan, as a work-in-progress. The system features a 1.4-m magnet length, a 71-cm patient aperture, and a 55 × 55 × 50-cm field of view. According to the company, "The Vantage Titan will be one of the most powerful MR units available, with a 30/130 gradient platform." It has a guaranteed homogeneity specification of 2 parts per million over a 50 × 50 × 50-cm diameter spherical volume. Toshiba also previewed its 3T MR system, which is designed to provide higher spatial resolution and shorter acquisition times. According to the company, the new system will be capable of whole-body imaging and will be able to "capture information not obtainable with 1.5T MR systems." Among the company's available MR systems, Toshiba showcased its first Vantage powered by the Atlas 1.5T system. The system features a 128-element integrated coil system and allows the user to perform multiple examinations without repositioning the coils. The system can be used with the company's 4 proprietary contrast-free MRA techniques: Fresh Blood Imaging, Contrast-free Improved Angiography, Time-Spatial Labeling Inversion Pulse, and Time and Space Angiography. The company also showed new 4-dimensional volume imaging applications for the Aplio and Xario ultrasound systems and introduced the new Xario XG system, with a 19-inch monitor. MagView (Silver Spring, MD) showcased its paperless Patient History module designed to run on tablet PCs at RSNA. This module was designed to allow breast imaging facilities to electronically collect the same breast history information that patients are currently filling out on paper. The Patient History module was designed for use by people with little or no computer knowledge. The questions, phrased in layman terms, appear in large fonts, and large "Back" and "Next" buttons help the patient navigate through the system. Once the patient completes her questionnaire on the Patient History module, the information is securely uploaded to her record in MagView, thus eliminating the need for paper or for a staff member to manually enter the data. The system saves a patient's previous answers. Therefore, when a patient returns for her next visit, her prior responses are already populated on the questionnaire and she only has to enter any new information or verify that nothing has changed. Technology and Industry: RSNA review 2007—Part 1. Appl Radiol.